Pull 1/4-inch strings from 4 of the dried corn husks to wrap tamales; set aside. Cover all corn husks with warm water and let stand until pliable, at least 30 minutes. Set aside another 4 corn husks to cover rack. Make Pork Filling. In 10-inch skillet, heat oil over medium-high heat; add pork and ancho chile powder. Cook and stir about 6 minutes or until pork is no longer pink; set aside. In large bowl, mix masa, shortening, chicken broth and salt. Beat with electric mixer on medium speed to make soft dough. In 10-inch skillet, heat oil over medium-high heat. Add onion and garlic; cook until onion is golden brown. Stir in ancho chile powder, yellow chiles and chile paste. Cook about 1 minute to blend flavors. Cool 1 minute; stir into masa mixture until well blended. Drain corn husks; pat dry with paper towels. Place about 5 tablespoons tamale dough on each corn husk. Flatten slightly; make a small indentation with back of spoon. Place 4 to 5 pieces of pork on dough; fold dough around filling. Fold bottom third corn husk over filling; fold sides toward center, covering filling. Using corn husk strings, tie tops of corn husks to hold tamale together. In 5-quart Dutch oven, place round cooling rack on bottom. Pour boiling water into Dutch oven, almost covering rack. (Water should not touch tamales when they are added.) Place 4 empty corn husks on top of rack. Stand tamales on rack inside Dutch oven, leaning tamales against sides of oven. Cover; turn heat to low. Simmer gently 1 hour to 1 hour 15 minutes or until tamale dough is firm. (Add more hot water if necessary during cook time.) Let tamales stand, uncovered, 10 minutes. Carefully unfold tamales by removing string at top. Serve warm. 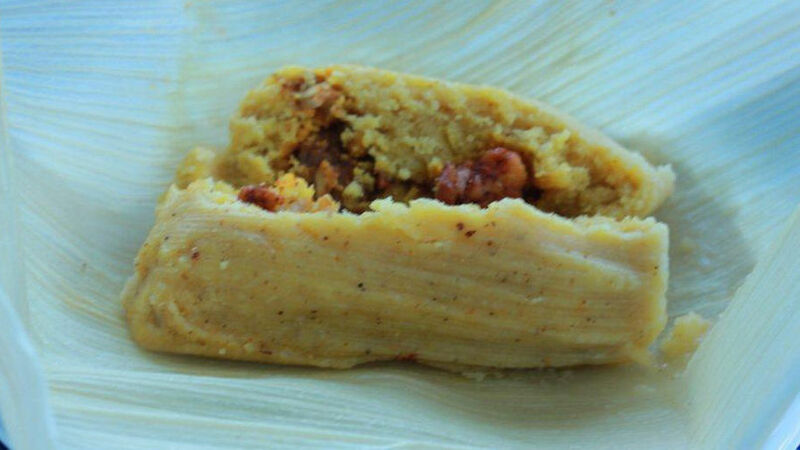 Progresso® chicken broth and corn masa come together in these Peruvian pork tamales - a perfect dinner!